Makes a wonderful textural and architectural plant that is easy to grow. One of our largest palms and ready to create an instant impact. Very slow growing, it slowly forms a trunk over many many years. Care - there are reports they are harmful to dogs if chewed. Supplied in a 24cm pot, 60cm tall, 20+ leaves - protect from cold indoors in winter. A real relic from the dinosaur age, this really does look like a lush prehistoric forest plant, but makes a wonderful textural and architectural plant that is easy to grow. Called the Sago Palm, it is a member of a very old type of plant called a Cycad. It looks perhaps a little more like a fern, but the tough fronds are much more rigid. Very slow growing, it slowly forms a trunk over many many years. This 24L, 1.2m plant is one of our largest palms and ready to create an instant impact when planted up and placed on your decking, patio or balcony. We've done the growing for you, so if you're impatient for quick results then this is the ideal way to get a large plant. Grow indoors in winter (they tolerate low light well as they almost shut down in winter), as plants can be damaged by frost, but they benefit from a summer holiday outside on the patio once frost risk has passed. Water them well outdoors, as this is when new fronds emerge for the year. They look great in modern planters. Care - there are reports they are harmful to dogs if chewed. This is common to lots of plants, but this one seems to have attracted some bad press. Cycas revoluta grows best in bright light, out of direct sunlight with increased humidity. Keep the soil moist, watering when the soil begins to dry slightly at the top. During the winter reduce watering. Over-watering or watering at the crown of the plant can cause the plant to rot. Humidity can be increased by standing the pot in a tray of gravel filled with water. 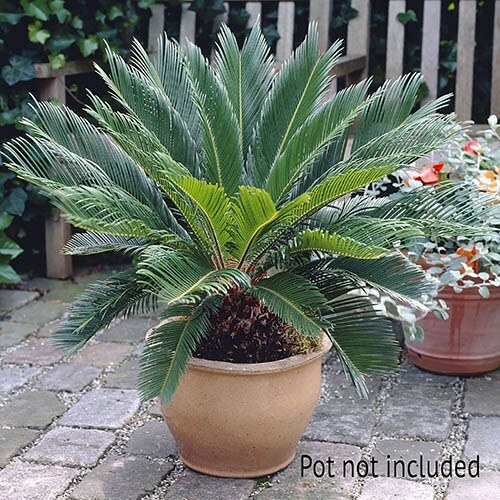 As the Sago Palm is a slow growing plant it does not need to be re-potted every year - once every 3 years would be fine. Feed once a month from April - October with a half strength liquid feed such as Blooming Fast Superior Plant Food. Please note that Sago Palms have been associated with toxicity to dogs and cats, so keep away from pets.